Danuta Danielsson, a Polish-Jewish woman whose mother was in a World War Two concentration camp, during a Neo-Nazi march in Växjö, Sweden on April 13, 1985. Photo by Hans Runesson. Voted Picture of the Century by Photographic Historical Society of Sweden. The neo-Nazi’s name was Seppo Seluska. He was a militant Nazi from the Nordic Reich Party, later convicted of murdering a gay Jewish man. In 2014 the Swedish sculptor Susanna Arwin made a miniature statue of Danielsson based on the photograph. There was an initiative to erect a life-size bronze version of Arwin’s statue in the city of Växjö, but the project was blocked by local politicians of the Centre Party believing that such a statue might promote violence. 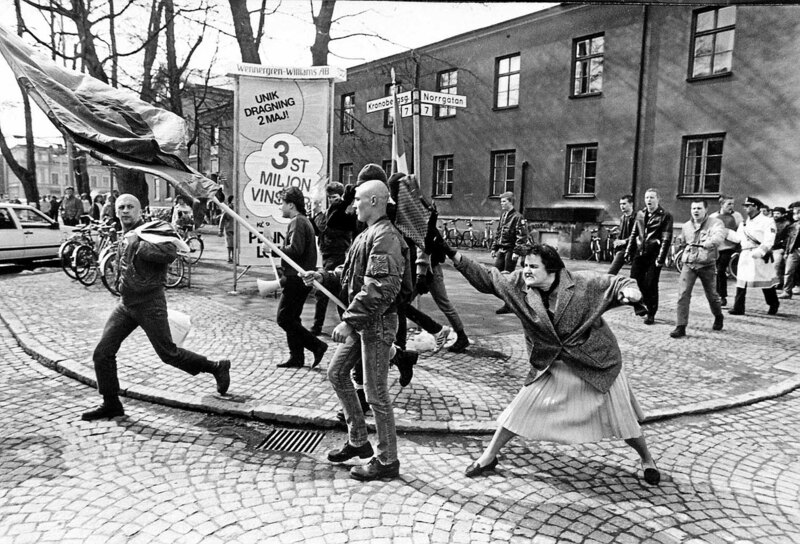 This entry was posted on December 21, 2016 by Vox Populi in Art and Cinema, Opinion Leaders, Social Justice and tagged Danuta Danielsson, Hans Runesson, Hans Runesson: Woman hitting neo-Nazi with her handbag 1985, Picture of the Century, Seppo Seluska.